Libraries are at a juncture right now--a sort of identity crisis, if you will. Many libraries are reporting downward trends in circulation and other traditional output metrics. 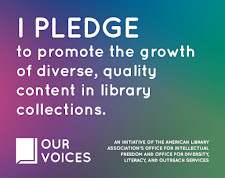 Yet many libraries are also seeing upticks in programming, gate count, etc.--indicators of participation in library spaces beyond materials use. 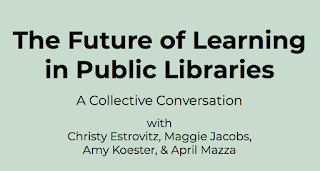 Libraries are using this juncture as an opportunity to assert ourselves as spaces for other valuable community resources, too: as hubs of democracy, as community hubs, and as learning centers, among other supplemental brandings. 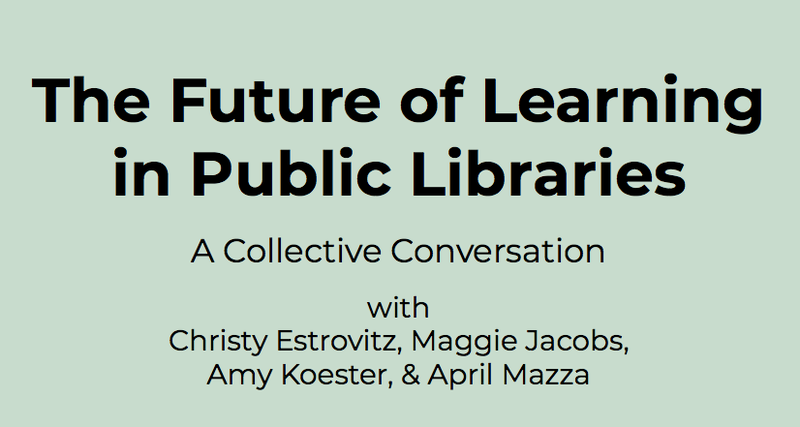 At ALA Midwinter’s Symposium on the Future of Libraries last weekend, I convened a panel of four librarians who, in our varied roles within varied institutions, have been thinking specifically about that role of libraries as learning centers. We shared what we’ve been thinking about learning in the public library. Today I’m sharing my perspective from my vantage point at my library. At Skokie, we have age-specific program coordinators in our Learning Experiences department who operate on a level between the management team--who sets the strategic direction and goals--and the front-line programming staff, especially those in the youth and adult departments. It’s the program coordinators’ responsibility to translate the library’s programmatic objectives into practically implementable program strategies and offerings. We do this by taking the goals set by the management team above us, combined with knowledge we have about programs and attendees from the front-line programming staff, and figure out the best way to implement our institutional goals into programming priorities. Based on what we’ve seen in program interactions in the past few years, what we’ve heard from our community, and what we’ve learned through our own explorations into the scholarship of learning, we’ve identified hands-on learning as a major priority for how we’re approaching learning-focused programming. Educational research points to hands-on learning as a successful strategy for facilitating meaningful learning at any age; in many educational communities, you’ll hear the phrase “hands-on learning is minds-on learning.” We’re taking what we’ve learned about hands-on learning and defined our focus broadly as workshops and opportunities that facilitate skill acquisition, practice, and ultimately creation. Hands-on learning is a core lens through which we’re considering, developing, and implementing educational programming options across all ages. If the library’s strategic goals and objectives are the bright light of a flashlight, hands-on learning is a lens that refracts that light into three key colors--or, in our case, three modes of thinking about hands-on learning. Our first mode for thinking about hands-on learning is intentionally facilitating skills acquisition and application. We’re thinking a lot about how we can move beyond one-time exposure to a skill and better support patrons in creatively applying the skills they learn. Behavioral scientists call this moving from a task being “explicit declarative”--where you have to actively think about every step of a skill in order to execute it successfully--and moving to a task being “implicit procedural”--the type of thing you can execute and apply without much conscious attention. A great example of this in our library is our ongoing Be the Chef program series, a hands-on cooking class that incorporates simple cooking skill practice as well as following and executing recipes. Think about something like knife skills--that’s a perfect example of a discrete skill, and one that you really have to concentrate on when you first learn it. With time and practice, however, knife skills become just another skill in your overall toolbox. Participants no longer have to concentrate so hard on using a knife, and instead are able to apply their skill to larger projects. They’re able to do more and do things creatively because of a foundational skill they’ve acquired and refined. Our second mode for hands-on programming is offering multi-day sustained learning opportunities--or more specifically, boot camp-style programs. These are multi-day programs on consecutive days that allow a smallish group of people--typically 12-16--to learn some basic skills, then put those into practice through guided challenges. For a robotics boot camp, for example, day one is about setting the stage with the basics: what is coding, what is the language and platform we’re using, what are the robots or objects we’re programming, etc. We spend that first day learning the foundations and taking baby steps putting it into practice. Then on day two, and sometimes day three, we really dig into those basic skills and creatively apply them in pursuit of a design challenge. It might be battle bots, or it might be robot races, or it might be creating a choreographed routine for a robot to follow. Whatever the challenge, it’s rooted in building sequentially on the basic skills. Multi-day sustained learning allows us to achieve deeper, more meaningful learning outcomes than traditional one-off programs, too, in which it might be days, weeks, or longer between when a patron comes to a program to learn a skill and when they ultimately have the opportunity to return and put that skill into practice. Multi-day boot camps build sequential learning over time into the fabric of the program. Our third mode for hands-on learning is providing ongoing, facilitated access to equipment and supplies. This goes beyond traditional programs with finite learning goals and start times into the realm of staffed spaces like makerspaces, STEAM spaces, or DIY spaces. Whenever possible, if we’ve offered a class, a workshop, or an initiative centered around a particular skill--and especially a specific piece of equipment that the library has purchased--we’re going to think about ways to support patrons who dipped their toe into that skill in continuing to practice and apply their learning in a setting that works for them. 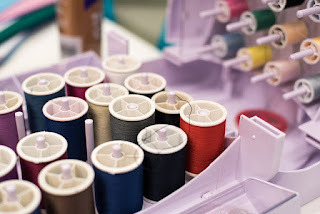 With a program like Open Sew, for example, patrons who attended a Sewing Basics program--or even those who have basic sewing skills but no machine, or it’s been a while since they used a sewing machine--those patrons can come to our open hours with the sewing and embroidery machines and use the equipment. There’s always a staff person present who can help troubleshoot and give basic guidance, but really these types of facilitated learning times are about allowing patrons to practice, refine their skills, apply what they’ve learned to make discrete projects or to be creative. Open Sew becomes a hands-on learning opportunity where one patron is sewing a hem on a skirt, another is starting to piece together a quilt, and another is looking to talk to peers about sewing machines and simple projects. These are the three modes of hands-on learning that we’re applying to our program offerings at my library--the program coordinators’ interpretation of what we can offer when we consider both institutional goals and the learning needs and interests of our community. I’m looking forward to applying the lens of hands-on learning as we think about our next round of programming. How are you thinking about learning in your library?